Andover The population was 2,371 at the 2010 census. Settled in 1761, the town was originally named “Emerisstown”. In 1746 it was granted to Edward Brown and others as “New Breton” or “New Britton”, having been granted primarily to soldiers who had taken part in the 1745 capture of Cape Breton during hostilities with the French in Canada. Among those soldiers was their regimental surgeon, Dr. Anthony Emery, a friend of Samuel Phillips, Jr., who in 1778 founded the Phillips Andover Academy in Andover, Massachusetts. “New Breton” would be incorporated as “Andover” in 1779, the year Phillips Andover was completed. In 1822, an academy was established in Andover, although it would close in 1828. Another school was founded in 1848 that would become Proctor Academy, the prestigious institution around which the town’s economy is based. Andover is noted for its antique shops, Greek Revival architecture, and two covered bridges. Potter Place Railroad Station, built in 1874 by the Northern Railroad, is listed on the National Register of Historic Places, and today serves as a museum for the Andover Historical Society. 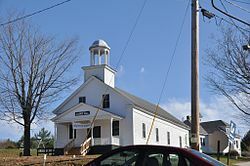 This entry was posted in Towns and tagged Andover, Blinds, History, Kearsarge, NH, Shades, Towns.